People often email me asking about swimming skills and techniques to get better in the water. Here are many tips that you can use to improve your swim times and confidence in the water. Recently I bought a pair of Rocket fins and booties. Up until now I have been using soft fins for your workouts and I have been able to fin 1 mile under 30 minutes with soft fins. With rocket fins, however, it feels much more awkward and painful. It seems as if my arm-pulls get me more propulsion than the flutter kicks with rocket fins. 1. Is there a specific technique to swimming with rocket fins? Does the kick have to be a certain width? It seems that bigger kicks give me a stop/start movement and interrupt my momentum but while smaller kicks give me constant movement they still don't seem to propel me that fast. There is a technique to swimming with fins, but no one best way as we all have different kick strengths. I have found that athletes in sports like football and soccer may not be the best swimmers without fins, but when they place a pair of SCUBA fins on their legs, they are faster than most people in the class. This is because they have well developed leg and hip strength and can use bigger kicks to build speed. Some athletes with less strong legs / hips tend to still swim fast, but are required to kick using smaller strides at a faster pace. You have to find out what works best for you personally. You will want to learn how to swim on both sides as well because you can alter your kick as long as your top leg always extends forward on both the left and right side. 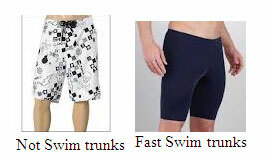 Learning to swim on both sides offers a form of ￂﾓrestￂﾔ by changing the pull ￂﾖ push stride of your left / right leg. As far as arm pulls and breathing as pictured in the video, the arm pull can be used as another method of propulsion, especially if you need to rest your legs by skipping a few kicks throughout a long distance swim. Many people like to do a slight pause of kicking when breathing and recovering the arms forward again to remain streamlined. As with any swimming, recovering your arms should remain stream-lined and not an obstacle to forward motion. 2. The fins seem to cause pain in my feet after a couple hundred yards and stiffness up the front and side muscles of my shins. Is this just a matter of conditioning and getting my feet used to wearing these fins? It is a matter of conditioning. When first wearing fins while swimming, you should only swim a few hundreds yards and push slightly past discomfort in the ankle and shin area. Do not push too hard and for too long at first as over use injuries like tendonitis in the feet and knees can flare up causing you to only be able to swim or run with severe discomfort or injury. This process usually takes about 10-15 swims or two to three weeks of swimming with fins. It is recommended to swim 500m with fins and if they start to bother you, take off the fins and swim 500m without, then try fins one more time until discomfort returns. Do this for a few weeks and you will be able to add greater distances each time you swim. Mask or Goggles? - In any Spec Ops training program you will wear a mask, so it is smart to start training with a mask versus a pair of goggles. However, prior to BUD/S, you are not allowed to swim the 500 yd swim (at boot camp) wearing goggles so get used to it without goggles as well. I like any soft nose mask made by Dacor or US Divers. 100m Pyramid Swim 100m keep pace between 1:20-1:40 for all Rest 30 secs Swim 100m Rest 30 secs Swim 100m Rest 30 secs Swim 100m Rest 30 secs Swim 100m Rest 40 secs Sprint 100m - ______? Swimming Without Water? Work the same muscle group as you do with swimming but for best results - SWIM to get better at swimming! Swim PT / Hypoxic Swimming Great workouts to do in the heat of the summer and cold of the winter (indoor pool). Triathlon Training Want to mix it up and try a triathlon? Here is a fun starter plan. Underwater Swimming Training - Underwater Swim Without Water - Learn to hold breath and move efficiently to maximize swim distance without maxing out breath and passing out.